Nina, a female Russian pilot, hunts a dangerous Nazi woman for her war crimes against children during the war. She has personal reasons for hunting down Lorelei, also known as The Huntress, who shot and killed an escaped American soldier in Poland and who tried to kill Nina as well. Nina grew up in the wilds of Siberia near Lake Baikal, but has to flee Russia because of her father's politics. Just after the war ended, she meets Ian, a war correspondent in Poland, who marries her to get her out of Europe and into the safety of England. Nina later uses her skills and training as a former Red Army pilot to help Ian and his business partner Tony, bring The Huntress to heel. The Nazi, Lorelei/Anna, changed her identity after the war and moved to Boston with her young daughter, Ruth, and blended in by marrying an American with a daughter. Ian and Tony are hunters of war criminals and go after The Huntress after they trace her to the U.S. They have personal as well as professional reasons for wanting The Huntress caught and charged. But the Huntress has a few more tricks up her sleeve. 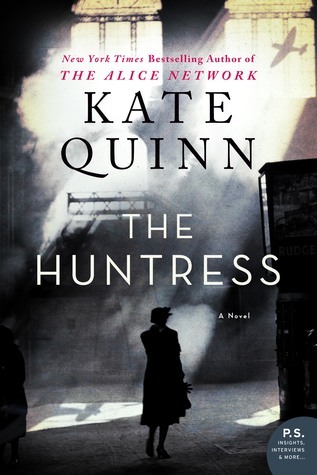 Suspenseful, well-written and plotted, The Huntress kept me reading well into several nights. Its theme is on the lesser known war criminals, many of whom moved to other countries and blended in, never revealed or convicted of their crimes. I gave the novel five stars. Thanks to William Morrow for an ARC of this book. Thanks for the review. Sounds riveting. Pretty interesting and suspenseful, Mystica. More about Russia and Stalin during WWII and the German push into Russia.